The Profoto B10 is here, and it's one of the most exciting advancements in lighting that I've seen in years. Months ago Patrick and I received a cryptic message from Profoto inviting us to an all expense paid trip to Alaska in September. Of course we agreed to go but Profoto refused to tell us what the event was about or who would be there. When we arrived we met a strange group of photographers. Many of them were famous studio, portrait, and wedding photographers while a large portion were famous "influencers" and "Instagramers" who had never used a strobe before. I actually started to wonder if Profoto was about to announce a new mirrorless camera. 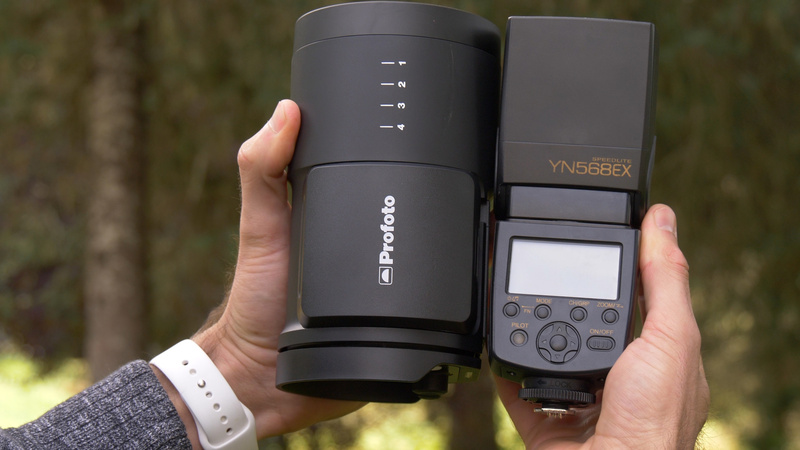 Luckily Profoto wasn't planning on competing with Sony, and instead they revealed the Profoto B10, a portable battery powered strobe with a color shifting LED for video that can also work on AC power. The B10 can also sync a LED flash with an smartphone to get studio lit shots without the need for a pro camera. At this point it all made sense. Profoto had made a light that could "do it all" in an extremely small package and they wanted to sell it to every photographer, even the ones who haven't considered buying lighting. I knew how special the B10 was from the moment I saw it, but for the next two days, they took us through every possible feature and function of the light. By the end of this event, everyone, including the instagrammers would want one. Why is the B10 special? The B10 is shockingly small. It's about the size of two speedlights. It's a strobe first but it also has a very powerful LED that is actually designed to work with video. Best of all, this is the first monolight Profoto has ever produced that can be used while it is charging. This means that the B10 is actually a great choice for studio photographers as well. 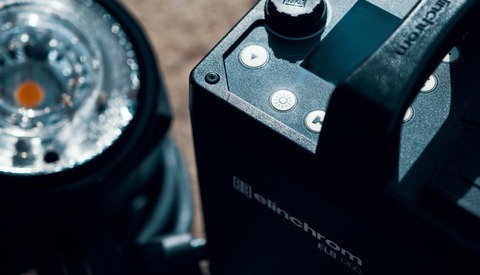 The battery that is included with the unit is capable of 400 full power flashes or around 700 flashes at half power. If you're using the LED for video, it can remain lit at full power for 90 minutes. Unlike the Profoto B1 and B1X, the charging port is no longer hidden while attached to the flash. This means that the battery is able to charge and power the B10 at the same time. This feature means that you may not need to buy extra batteries. If you were shooting a wedding for instance, you could leave the B10 plugged in at the church and reception but use battery power for outdoor portraits. Profoto has really stepped up their game when it comes to design. Obviously the flash is small, but everything about it feels high end. I was told that the B10 does have a fan but nothing about this light feels hollow and there are no noticeable holes for a fan. During my 4 days with this light, the fan has never come on, and if it has, I certainly couldn't tell. As a videographer who is constantly worried about sound, this was extremely important to me. The screen on the back is now a high res color display. The buttons and UI have been simplified and updated too. The bottom of the B10 has a quarter inch thread which allows you to easily mount it to a tripod directly or you can use the included tilting umbrella bracket to attach it to a light-stand. There are a few issues I have with this light but in my opinion the physical design of this light is flawless. Profoto claims that the B10 is as powerful as five speedlights. We put this to the test and found that the B10 is comparable to around 2.5 speedlights or around 1.3 extra stops of flash power. Keep in mind that our test was far from scientific and if our results are disproven, we will happily update this. We didn't have another LED light with us to compare the power output of the constant light but the B10 appeared to have similar output to our Fiilex 360EX light which we are currently using in our studio. The Fiilex light is not particularly bright but we use it because it will accept all of our Profoto light modifiers. The LED light is not powerful enough to be used outside unless the sun has set but it may be enough for studio work. The Profoto Air Remote is basically a mandatory accessory to this light. The light itself has a receiver built in but you will need an Air Remote to put on your camera to trigger it. The remote is extremely reliable over long distances and it also allows you to change the power output of multiple lights remotely, but it does have one major inconvenience... Even though the remote allows you to change the power of the flash, it doesn't actually show you the flash output so you will still find yourself staring at the back of the light to figure out your settings. Profoto has partially fixed this by introducing a new iPhone App that has this missing feature. The B10 is capable of connecting to your smartphone via bluetooth and with the new Profoto app you will be able to see and control the settings on each of the lights. This seems particularly useful to me if you were using the lights for a video and you couldn't easily reach them. With the app you can turn lights on and off, dim them, and color shift them individually. Using the app during a still photoshoot, like a wedding, feels more cumbersome than helpful to me but I'm sure some photographers will like it. 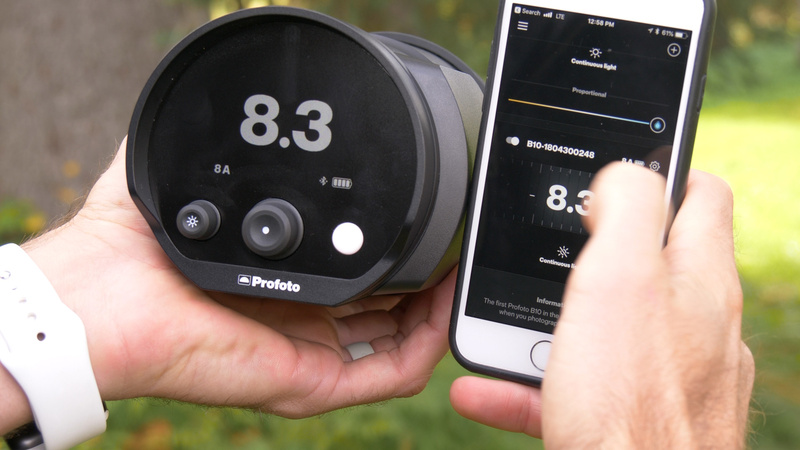 The Profoto app also has a camera function built in that will use the LEDs in a high powered "flash" mode that is capable of syncing with a phone's digital shutter. This will allow photographers to get even better looking shots with their phones. I'm not sure that I personally will ever need this feature but I can certainly understand why Instagrammers will love it. This is where Profoto is probably going to lose most of you; the B10 is $1595 for one and $3195 for two and it comes with a custom backpack. Some photographers will be able to justify paying this while most will not, but that is right where Profoto likes to be. If you were on a budget, you could buy a flash and a color shifting LED panel for less than $100 on Amazon but the B10 is all about convenience. 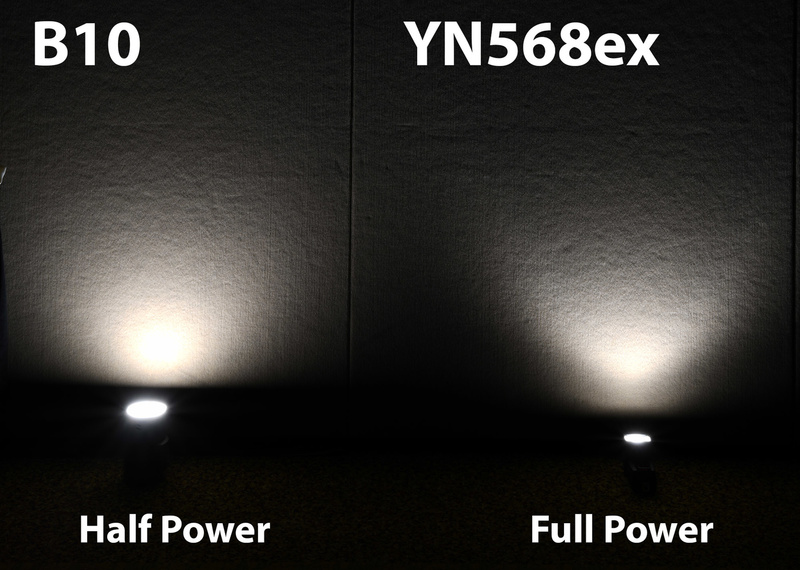 If you want one light that can do it all, and can be used with battery or AC power and can be controlled wirelessly, this may be the only option at the moment. I really wish Profoto could have made the B10 $999 and at that price they would have truly made a light that would be appealing to almost every photographer, but at $1600 it's certainly not for everyone. Profoto is betting a lot on the new B10, and I think I know why. 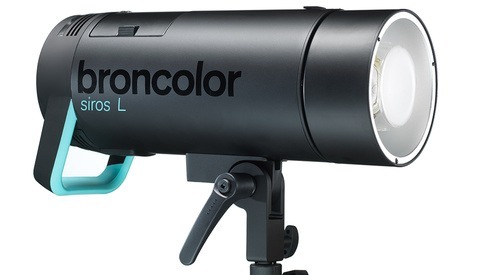 I bet it will become the most successful Profoto product they've ever released. Is it for everyone? 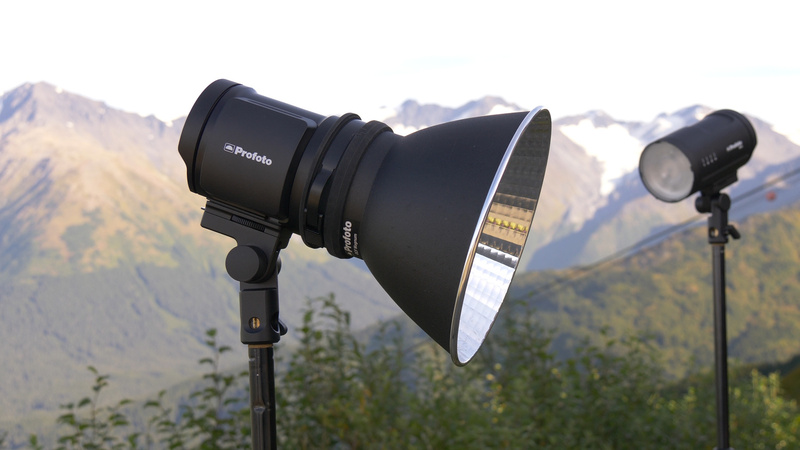 Of course not, it's extremely expensive, but everything Profoto makes is extremely expensive. Most photographers can't justify these prices because they don't rely on these features but if you're a professional, paying the premium for a light like this might actually be a really easy decision. The B10 is actually capable of replacing three different lights: AC powered strobes, battery powered strobes, and a color shifting LED. When you look at it that way, the price begins to make a little more sense. If I was still shooting weddings I would probably buy three of these and I would use them as studio lights during the week, battery powered lights for on location portraits, and then I would plug them in during wedding receptions. But, if you don't need a light that can "do it all" there are so many other cheaper options to consider as well. I've been shooting with Profoto for years now and I love their system but I'm the first to admit that it's a luxury branding with a luxury price. I'm personally very excited about the B10. Yes I can always wish for more power and a lower price tag but for the way I shoot, this little light is about as close to perfect as I could wish for. Yes, the tactile response to a thing can add to the satisfaction of its use. I enjoy shooting with my Canon 5D3 because it feels good in the hand, and that tends to translate to my creativity. Whilst the Sony offerings are exceptional, I don't like them in my hand and I just know this would impact how I shoot. It's not as dramatic with strobes, but teher is a "warmth" to the feel of a Profoto. It's down to the type of material and how it conducts heat. And the smooth lines add a sense of luxury. Nothing to do with quality of output or light, but when you're spending oodles of ££, it's nice to hold something that feels nice. Prior to April 2016 I used several strobes to achieve HSS (or some variation like Supersync) and each didn't have the ability to display the power of the light on the transmitter. As someone who enjoys sharing how photos were achieved needing to reply on memory to record the power output was frustrating. Then the Godox AD600 came out and the cheap $50 transmitter capable of both HSS and TTL had that ability. I find it insane that Profoto still doesn't on their TTL transmitter and the only way at the moment is using an app. Nobody wants to have to rely on an additional item for that. You also mention HSS which was available to Godox for some time now throughout the power range of 1/256-1/1. Profoto had it but only from power 7-10. In fact, it was only until I think last year in May that Profoto updated the light to have a wider range. If you are heavily invested in Profoto I would suggest investing in three Godox AD400s that have the ability to use Profoto modifiers when you get the Profoto mount for it. That would be around the cost of a single B10 but with more to offer. You might not care to see your power output but many others do. Edit: You can also turn the modeling light on and off remotely with Godox. Valid arguments. Still the latest controller from Godox delivers you from fiddling with the flashes. And it also converts TTL reading to manual. Godox are getting better and better for certain. It’s a shame that the Cactus RQ250 wasn’t funded as it could have been a good alternative. Sounds like a very practical product to travel light. While I have all my stuff invested in another brand, I can see this product work for me independently for specific shoots. Regarding price, stop crying people, go shoot and pay them off with extra jobs and forget that down side. Do you have a need for them or not, that's where it stops. There is a reason why quality lights even 20 year old product stay highly priced on ebay. I think the B10 is a perfect addition to anyone who has invested in a Profoto system. Everyone else will simply be using Godox. It's simple common sense. I view it differently, anything low ws made to be portable is not about getting 3 or 4 lights, more like 1 or 2. Therefore compatibility is not a must have. Past 2 lights the value of portability can fade off rapidly. Buying into a full system is another market. Before Godox, "everyone" was AB. Personally I use a high end brand, probably 75% purchased used, and grew my inventory with that strategy. Being able to cover anything with maximum flexibility and mix accessories are a must in smaller market in my opinion. I know some who never grew from more affordable brands disregarded the value of accessories and limited their options into an over crowded market. Lee Morris :If you still have the unit, how many rapitly flashes can you trigger in TTL HSS mode before over hear protection hits in? On close to full power? Why not? They must have overheating protection. I for one would be wery interested if Profoto unit can take the heat, so to speak. Also I am interested if you can connct the unit to the wall outlet and run it with no battery? No, the plug goes directly into the battery. Great video and write up Lee! You hit it home on this one, and I for one totally agree with all of your points ESPECIALLY as a wedding photographer. Having just taken delivery of the B1X location kit (backpack with two lights) I am hooked with Profoto, and coming from a 7 year relationship with Elinchom I see the value as a working pro. Adding in two B10's will give me a nice lightweight option for the international weddings I shoot, and at home here I can use them as kickers along with the B1X's. I think this is great! For those who don't mind a recessed flash tube, save yourself $1,600 and bungee cord two speedlights together for a similar result. I can confirm your thoughts on the power output vs, two speedlights. I just did a test with the B1X here in my house. At power level "9" on the B1X (250ws) I got the same exposure value on a subject at the same distance as I did with two Godox V850 Speedlites at full power side by side. So, I think your guess Lee on power is correct. I wonder why they said 5 speedlites? Maybe with the Magnum reflector (this will add 2 stops), and honestly I think is amazing! I want to get the Magnum for my B1X's to help give even more power for the sun! Lee you mentioned that "I'm happily entrenched in the Profoto ecosystem so I don't keep up with all the new tweaks of other brands." Maybe that is the problem with most Profoto or Elinchrom or Broncolor users, and that because they haven't been noticing or even giving these new flashes a worthy try that they aren't really seeing how well they perform or how worthy they are of their price. I am not saying Godox AD600pro is better than the D1 or that 400pro is a much better buy than the B10 (but I still am not able to find a reason why I want to by a B10 over the AD400pro other than to tell people I own a Profoto) but it's has certainly caught up. 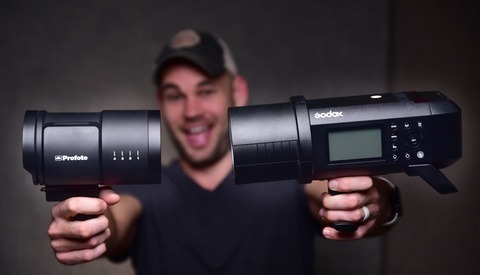 So caught up that most of the forum I see, people use the Godox system to compare to Profoto. I am pro that have been using Profoto D1 in the Studio and Godox at home and in the field. Quite frankly I have used Godox for really big advertising projects and I have never gotten any negative feedback with color inconsistencies or exposure inconsistencies. I am sure there will be inconsistencies but what I mean it has never been an issue nor have I gotten a complain from editors or the client. To be frank I think the exposure inconsistencies with the D1 is actually quite disappointing considering it's price. Let's look at the B10 without a branding label at the moment. If it was a Godox would you pay over$1000 for it? and if the AD400 had the exact features would you pay $1600 for it considering it has 400Ws and color stabilization mode? I am not saying Profoto is a bad brand. But I think like Leica they make good cameras, but how many of you are using Leica's for work? In terms of customer service. Profoto customer is not that great in Asia, meanwhile Godox has excellent customer service. They even replaced a unit that my assistant damaged due to user error. I only had to pay for shipping. So fo US users I can know why some people are frustrated with Godox especially when things go wrong (after all it is electronics and units will fail), but it's like why Apple is not working in China and Chinese brands are taking over mobile devices. At the end of the day how many units do you think Profoto Sells and how many units do you think Godox sells? The turnover of Godox the widely acceptance of its products today will make Godox into a industry leader one day believe or not. I have spoken to the brand and its customer service and they are a very determined brand to listen to it users. Profoto on the otherhand, well you can continue placing yourself to be the Porsche's of photography lighting but Photographers are superficial people, at the end we don't bring our monolights out on a date to impress them. We just look at practicality and quality and sure on a scale of 1 to 10 I give the profoto brand now an 8 and probably Godox somewhere around 6, but that 6 is moving up quickly. Very true. We will do a comparison with other lights soon. I keep up to speed - to a limit. I notice new products snd have a look, but I don't keep up with firmware updates otyherwise I'd never leave my screen. And of course I don't really need to because I've got all the lighting that I'll need for an age. I may never buy another light again. (8 Profotos should do me for a while). I didn't but the Profoto because of the badge. I bought it after careful testing with a meter. Repeated flashes at minimum power and not a 1/10 stop variance... that had me sold. I was used to getting 1/3 stop variances with my Bowens or sometimes more at very low powers, and when you're shooting with 5-6 strobes on a subject, that can be frustrating. Purchases are also bought on trust. Profoto has been around for an age and their rep is for excellent build quality. The B1's and D1's have been around for a very long time and have proved themselves for many hard working pros. You can fire these things all day without a hiccup. I am painfully aware of failures with capacitors, (with a high end broadcast camera failing completely because of sub-standard capacitors. (Turns out spending £20,000 on a camera doesn't always guarantee the best components). Age and use play a factor with these things and whilst Godox may be using excellent components, they haven't been making things like the AD600 pro for long enough to have the same track record. These things are earned with time. We need to see beyond mere specs or immediate performance to realise the differences. Case in point - I hjad two types of Bowens light. Both same power, both same efficiency. But Bowens warned me that the cheaper of the two strobes wasn't as good for flying as the Pro version. The reason...? The PCB's inside of the Pro didn't have heavy components but rather were attached via cabling, (so part of the higher expense) whilst the cheaper strobes had heavier parts direcly fixed to the boards, (and so manufacture was a little cheaper). The cheaper lights would not have fared as well with heavy bumping and travel. Certainly not obvious at first glance - but nothing is for free. Or little things like simple grids for reflectors. I ould get a set of 3 or more from a 3rd party, for the price of just one Profoto. Crazy, until you get the Profoto one... built like a tank and not as easy to deform with careless fingers. On paper they do the same. In reality, and only with personal use, did I notice the huge difference. Nothing is for free. I'm hoping my Profotos will out-live me, (not a hard task I sometimes think), and their pedigree assures me of this. Godox then or maybe now would be more of a gamble. So yes my Profotos are expensive, but I'm divinbg that with a 15+ yr expectancy at the very least and most likely more. Some photographers are superficial. Me...? I'm less so. I stick with a brand until it proves not to be a good case. I stuck with Canon speedlights until I liked the radio capability of the Godox tt685. But then I found my old Canon EX580's were much more predictable with ETTL, so now I use a combo of Canon and Godox to get the best results. Profoto service is not good from Profoto in the UK. But fortunately there are excellent 3rd party service agents who specialise in Profoto, so my needs are met. But Godox support in the UK is poor with no 3rd party people that I know of. (I regard my Godox speedlights as almost disposable as they're so cheap). People seem to think that Profoto is building the same light as Godox and just making a big margin. I'd say that is not the case. Laws of diminishing retuns plays here, so we guage whether the gain is worth the £££. But nothing is for free. Could Fstoppers give several different professional A Godox, Profoto, Broncolor (lights that are most equivalent to each other in grade and power) and let them do a test and review to see what they think? Can we'll get some reading of light outputs with a light meter? The profoto system is just great for full time professionals who need high quality that allways works. I'm an amateur and with my ad600pro and the two v860II flashes and the new pro-trigger i get an amazing good working system for a very valueable amount of money. Great review and of course I would love to own some Profoto gear but for the average joe like me my AD200's and AD600pro is all I really need. Another reason I love Godox is the ability to fire the strobes and using my godox speed light and also having my second shooter share the strobes with me at the same time (canon and nikon) for some great off camera lighting shots during event photography and weddings. I'll just go with two AD200's in a Magmod Magring and have a similarly sized kit with way more power for less then half the price. Get an AD-B2 adapter for them and you get two bright modeling lamps as well. I love my dual AD200 setup.